We’ve been close friends for years. I see you almost every day, some days more than once. I’ve visited you in over half a dozen countries, and there are probably half a dozen locations in Silicon Valley where you know me and my drink by name. I’ll be there for you when you need me, and I know you’ll be there for me when I need you. That’s why we need to talk. About your mobile app and the app marketing it uses. I use your mobile app every day. I love that it works in different countries. I love that it auto-reloads, and it (finally) gives me free drinks without the annoyance of postcards in the mail. And I will tell you, the Starbucks store-finder is a life saver in more ways than one. 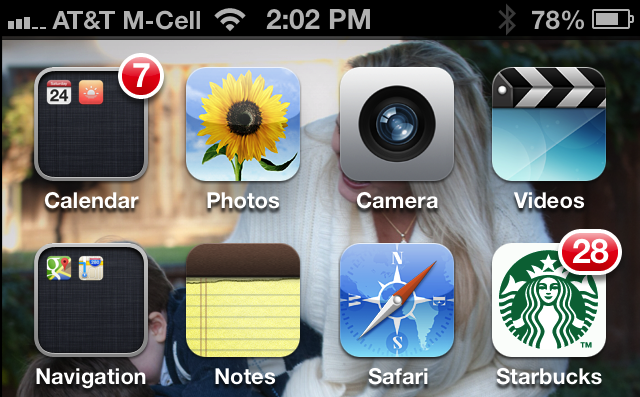 It’s on the homescreen of my iPhone 5. Not in a folder. 2nd row. It’s #8 with a bullet. There are barristas at five different Starbucks who know the drink I normally order. The one in Los Altos actually knows the drink I usually order for my wife too. And yet, after over 1000 orders, you still don’t know my favorite drink? Know what drinks I’ve ordered, and rank them by the number of times I’ve ordered them. Know what I’ve tried, and what I should try. Your best barristas try to know their customers & their drinks. Why not your app? 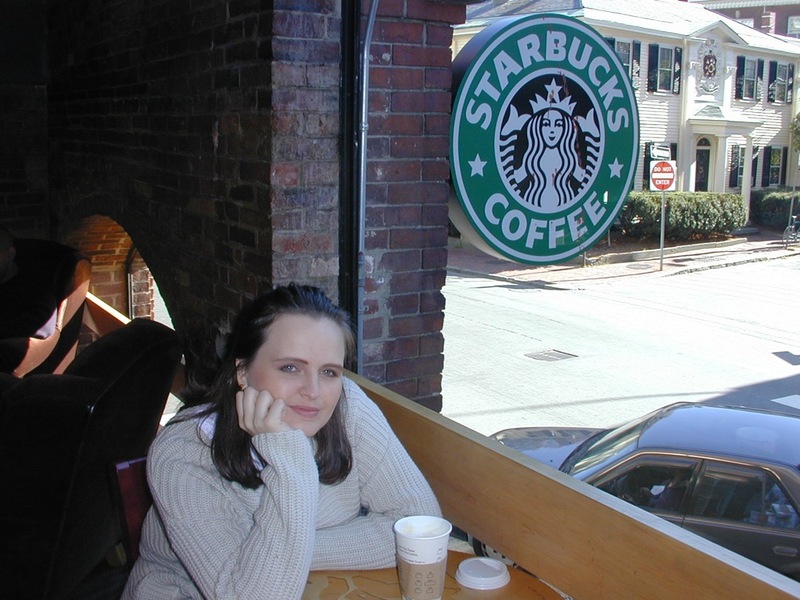 I’ve been to dozens of different Starbucks. If I drop the kids off a school, I might grab my morning drink at the Starbucks on Alma. If I’m late, I might go straight to the office, and walk to the one on University. If I’m heading to San Francisco, I’ll stop at the one in Los Altos before jumping on 280. For each visited Starbucks, show me when I visited them last. Show me what I ordered. If I break pattern, it’s even OK to suggest a drink to me. You could know all of this, of course. But you don’t care. On most days, your barristas do a great job. But did you know that the line at the Los Altos location is really long during the week? Or that the Starbucks on Alma is the fastest? Did you know that sometimes, your barristas see me, place my order, and have it made before I get to the head of the line? I want to tell you these things. I want to let you know when your barristas are amazing. I want to tip them. I want them to get promotions. I want them to know they are appreciated. Your mobile app eliminates tipping, and devalues my relationship with the barristas. It should be the other way around. I go for my daily coffee on the way to work. I walk to Starbucks for a meeting. I go to Starbucks as part of a social destination. I go to Starbucks to relax and read. The problem is, you seem to only care about the last 3. For the first use case, I just don’t have time to kill. I’m alone, and I need to get in and out as quickly as possible. I love you, but sometimes I just don’t have time for the experience. I promise, we’ll catch up later. If you are worried about the casual user not getting the “Starbucks experience”, I understand. Maybe this should be a perk for being a frequent customer? Since we’re being open and honest, I might as well tell you what no one else is. Just stop with the nonsense with the app of the day, song of the day. You are giving me a red badge on my app EVERY DAY for something that no one wants. It’s beneath you. You are better than that. Notify me because you have a new drink, and since I’m such a loyal customer, I get one free. Notify me because 95% of the time I’ve visited Starbucks on Wednesday by 10am, and check to see if I want one today on the house? I don’t want to hear about wireless charging mats. Seriously. I love you Starbucks. Tell me you love me back. Today, Research in Motion Blackberry announced with great fanfare their new Blackberry 10 operating system and devices. Unfortunately, the market has shifted so radically in the past few years, it’s not clear to me what path exists for any meaningful success for Blackberry. Blackberry is on an impossible mission. I used a Blackberry for over seven years. In fact, I didn’t move to the iPhone until the 3G came out with the native application platform. Like many, I was addicted to the perceived and actual productivity of messaging on the Blackberry and the physical keyboard. Like most people who make the switch, it took me a few weeks to get to be “good enough” to type and message effectively on the iPhone. The millions who are still on the Blackberry tend to focus on exactly one issue: the Blackberry is an amazing messaging device, thanks to the keyboard & software optimization. I remember, in 2009, making a Blackberry my temporary “full time” mobile device for a few days. It was amazing – in just a year, I had completely lost all the muscle memory that made me so productive on the Blackberry. The iPhone had won. The reason is simple: a fast, modern device that offers the full richness of the modern web, combined with a vibrant and high quality native application market dominates the marginal efficiency in messaging. Whether you use iOS or Android, minor productivity improvements in SMS & Email are swamped by access to applications, games, web services, cloud platforms and a myriad of other capabilities. The smartphone itself has now evolved into a variety of form factors and niches, with phablets and tablets eating an increasing share of our attention and computing. Right now, it seems like Blackberry has no viable path as a third platform. Yes, the ardent users of the platform can buy the new devices for their hardware keyboards. But there aren’t enough of them (h/t to Daring Fireball), and it’s hard to imagine that this market won’t get eaten by the flexibility provided by the Android platform in time. Yes, there are IT departments that continue to have their companies locked down on the Blackberry, but it’s unlikely the the new operating system won’t create sufficient migration issues that they won’t move to either iOS, Android or both as supported platforms. The real problem is that their touchscreen product cannot possibly provide enough unique functionality to justify the choice over the iPhone or Android at the medium to high end. At the low end, they cannot possibly underprice the Android ecosystem. In other words, if they abandon their customer-defined differentiator (keyboard), they’ll lose all differentiation in the market. If they don’t, they are left with an eroding, minority share of a market that is likely insufficient in size and economics to fund their continued development and support of a competitive mobile ecosystem. As a developer, spending precious resources on this, at best, stagnant minority pool of potential users is tough to justify. Microsoft can play this game, for a while, because they (still) have relatively unlimited free cash flow and a desktop platform that still boasts hundreds of millions of users. Blackberry doesn’t. This is an extension to my original three post series on user acquisition. Over the past few months I been fortunate enough to give over a dozen talks at various events and companies about user acquisition, virality and mobile distribution. One of the best parts of the experience is that, without fail, every talk yields a new set of questions and insights that help me learn and refine my own thinking on distribution & growth. One of the most common questions I get is around the difference between my definition of “viral factor” and the semi-standard definition of “K Factor” that has been floating around for a few years. Wikipedia offers a fairly concise definition of a K factor, a term borrowed from epidemiology. This usage is borrowed from the medical field of epidemiology in which a virus having a k-factor of 1 is in a “steady” state of neither growth nor decline, while a k-factor greater than 1 indicates exponential growth and a k-factor less than 1 indicates exponential decline. The k-factor in this context is itself a product of the rates of distribution and infection for an app (or virus). “Distribution” measures how many people, on average, a host will make contact with while still infectious and “infection” measures how likely a person is, on average, to also become infected after contact with a viral host. This blog post from Mixpanel in 2009 does a great job of walking through the standard definition of Z factor. Hat tip to Dave McClure for his slide, which is included in the post. 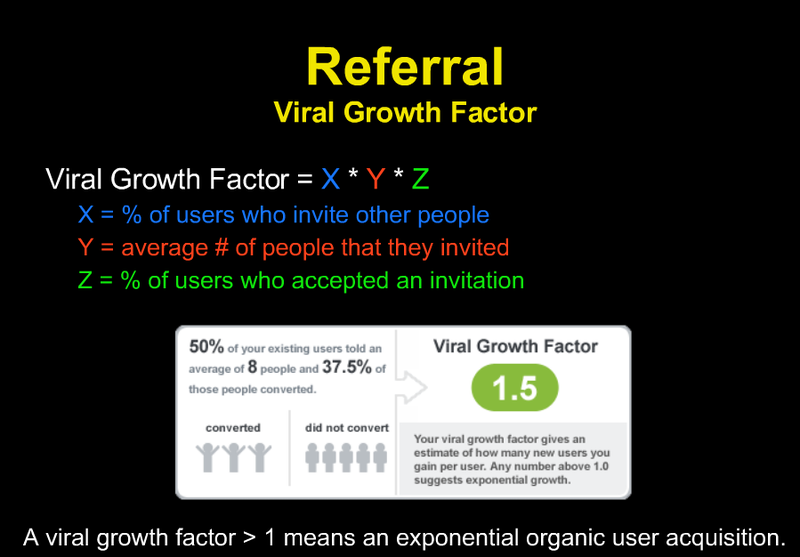 Based on this framework, the Z factor is literally the percentage of users who accept a viral invitation that they receive. The key to understanding viral math is to remember a basic truth about rabbits. Rabbits don’t have a lot of rabbits because they have big litters. Rabbits have a lot of rabbits because they breed frequently. You’ll notice that, unlike the other popularized definitions, I focus on a new variable, “N”, the number of days it takes for your viral cycle to complete. I do this for a simple reason: cycle time matters. The path to success is typically the combination of a high branching factor combined with a fast cycle time. If you don’t think deeply about the channels you are using for viral distribution, you risk prioritizing the wrong features. How Do You Pick the Right Cycle Time? Once a growth team digs into the numbers, they quickly realize that there is no one “cycle time”. So what number do you pick for analysis? There is no right answer, but in general, you tend to find in the data that there is a breakpoint in the data where a vast majority of all viral events that are going to complete are going to complete. For example, maybe with a viral email you’d see most responses happen in 24 hours, with 90% of total responses happening within 3 days. If that’s the case, picking 3 days might be the right cycle time for your feature. Once you pick a cycle time, the conversion rate gets built into your projections. If you are already focused on the new user experience, distribution and virality, well then kudos to you and team. Too many consumer products to this day spend too little time focused on these problems. But if you want to see clear, demonstrable progress from your growth team, make sure you include cycle time in your thinking about what viral features will be most effective for your product. Now go out and make a lot of rabbits. On a personal note, I hadn’t actually been back to visit NASA Ames Research Center since my internship during my senior year in high school (21 years ago). Back then, I was helping develop simulation software for fluid dynamics simulations in Fortran. Thankfully, no one asked me to code in Fortran during the Q&A. The team at Singularity U was incredibly gracious, and I appreciated the opportunity to talk to the class. The Game Has Changed. Design for Passion. One of the most exciting developments in software has been a resurgence in the focus and priority on design. With the growing dominance of social platforms and mobile applications, more and more people are growing comfortable productively discussing and utilizing insights about human emotion in their work. The progress of the last five to seven years is really a significant breakout from the previous generations of software design. For decades, software engineers and designers focused on utility: value, productivity, speed, features or cost. If it could be quantified, we optimized it. But at a higher level, with few exceptions, we framed every problem around utility. Even the field of human-computer interaction was obsesses with “ease of use.” Very linear, with clear ranking. How many clicks? How long does a task take? What is the error rate? In some ways, Google (circa 2005) represented the peak of this definition of progress. Massive data. Massive scalability. Incredibly utility. Every decision defined by quantifying and maximizing utility by various names. But let’s face it, only computer scientists can really get passionate about the world’s biggest database. Like any ecosystem, consumer technology is massively competitive. Can you be faster, cheaper, bigger or more useful than Google? It turns out, there is a more interesting question. Social networks helped bring the language of emotion into software. A focus on people starts with highly quantifiable attributes, but moves quickly into action and engagement. What do people like? What do they hate? What do they love? What do they want? In parallel, there have been several developments that reflect similar insights on the web, in behavioral finance, and the explosion in interest in game mechanics. Human beings are not rational, but (to borrow from Dan Ariely) they are predictably irrational. And now, thanks to scaling social platforms to over a billion people, we have literally petabytes of data to help us understand their behavior. Once you accept that you are designing and selling a product for humans, it seems obvious that passion matters. We don’t evaluate the food we eat based on metrics (although we’d likely be healthier if we did). Do I want it? Do I love it? How does it make me feel? I don’t really like to talk about health mmainly becase I’ve had some bad experiences with hospitals, last month I had to report some hospital negligence claims, I went to the docotr and I was treated whihc so much disrespect I was humiliated so I prefer to leave health out of this. The PayPal mafia often joke that great social software triggers at least one of the seven deadly sins. (For the record, LinkedIn has two: vanity & greed). Human beings haven’t changed that much in the past few thousand years, and the truth is the seven deadly sins are just a proxy for a deeper insight. We are still driven by strong emotions & desires. Metrics oriented product managers, engineers & designers quickly discover that designs that trigger passion outperform those based on utility by wide margins. One of the reasons a number of earlier web giants are struggling to compete now is that the game has changed. Utility, as measured by functionality, time spent, ease-of-use are important, but they are no longer sufficient to be competitive. Today, you also have to build products that trigger real emotion. Products that people will like, will want, will love. Mobile has greatly accelerated this change. Smartphones are personal devices. We touch them, they buzz for us. We keep them within three feet of us at all times. How do I feel when I use this? Do I want that feeling again? What powerful emotions surround this product? Go beyond utility. Design for passion. This is the first post in a three post series on user acquisition. The topic of this blog post may seem simplistic to those of you who have been in the trenches, working hard to grow visits and visitors to your site or application. As basic as it sounds, however, it’s always surprising to me how valuable it is to think critically about exactly how people will discover your product. In fact, it’s really quite simple. There are only really five ways that people will visit your site on the web. That’s it. If someone found your site, you can bet it happened in those five ways. The fact that there are so few ways for traffic to reach your site at scale is both terrifying and exhilarating. It’s terrifying because it makes you realize how few bullets there really are in your gun. It’s exhilarating, however, because it can focus a small team on exactly which battles they need to win the war. Organic traffic is generally the most valuable type of traffic you can acquire. It is defined as visits that come straight to your site, with full intent. Literally, people have bookmarked you or type your domain into their browser. That full intent comes through in almost every produto metric. They do more, click more, buy more, visit more, etc. This traffic has the fewest dependencies on other sites or services? The problem with organic traffic is that no one really knows how to generate more of it. Put a product manager in charge of “moving organic traffic up” and you’ll see the fear in their eyes. The truth is, organic traffic is a mix of brand, exposure, repetition, and precious space in the very limited space called “top of mind”. 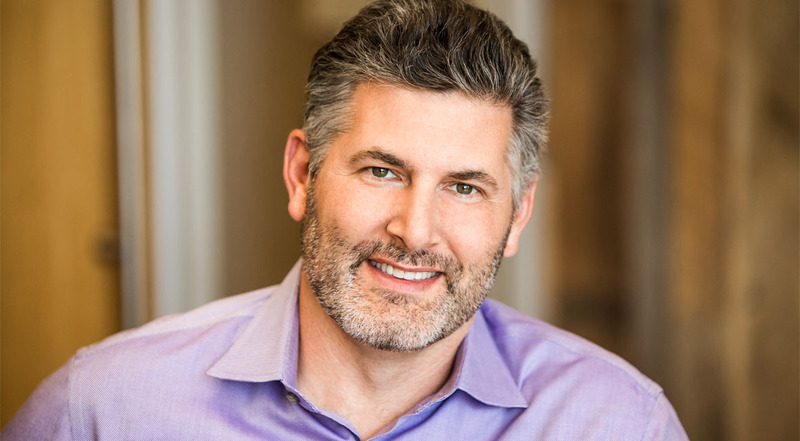 I love word of mouth, and it’s amazing when it happens, but Don Draper has been convincing people that he knows how to generate it for half a century. Everyone complains about the flood of email, but unfortunately, it seems unlikely to get better anytime soon. Why? Because it works. One of the most scalable ways for traffic to find your site is through email. Please note, I’m not talking about direct marketing emails. I’m referring to product emails, email built into the interaction of a site. A great example is the original “You’ve been outbid!” email that brought (and still brings) millions back to the eBay site every day. Email scales, and it’s inherently personal in its best form. It’s asynchronous, it can support rich content, and it can be rapidly A/B tested and optimized across an amazing number of dimensions. The best product emails get excellent conversion rates, in fact, the social web has led to the discovery that person to person communication gets conversion person over 10x higher than traditional product emails. The Year In Review email at LinkedIn actually received clickthroughs so high, it was better described as clicks-per-email! The problem with email traffic generally is that it’s highly transactional, so converting that visit to something more than a one-action stop is significant. However, because you control the user experience of the origination the visit, you have a lot of opportunity to make it great. The realization that natural search can drive traffic to a website dates back to the 90s. However, it really has been in the past decade in the shadow of Google that search engine optimization scaled to its massive current footprint. Search is big, and when you hit it, it will put an inflection point in your curve. But there is rarely anysuch thing as “low hanging fruit” in this domain. The fourth source of traffic is paid traffic, most commonly now ads purchased on Google or Facebook. Companies spend billions every year on these ads, and those dollars drive billions of visits. When I left eBay, they were spending nearly $250M a year on search advertising, so you can’t say it doesn’t scale. The problem with advertising is really around two key economic negatives. The first is cash flow. In most cases, you’ll be forced to pay for your ads long before you realize the economic gains on your site. Take something cash flow negative and scale it, and you will have problems. Second, you have solid economics. Most sites conjure a “lifetime value of a user” long before they have definitive proof of that value, let alone evidence that users acquired through advertising will behave the same way. It’s a hyper-competitive market, armed with weapons of mass destruction. A dangerous cocktail, indeed. While ads are generally the wrong way to source traffic for a modern social service, there are exceptions when the economics are solid and a certain volume of traffic is needed in a short time span to catalyze a network effect. Zynga exemplified this thinking best when it used Facebook ads to turbocharge adoption and virality of their earlier games like FarmVille. The newest source of scalable traffic, social platforms like Facebook, LinkedIn and Twitter can be great way to reach users. Each platform is different in content expectations, clickthrough and intent, but there is no question that social platforms are massively valuable as potential sources of traffic. Social feeds have a number of elements in common with email, when done properly. However, there are two key differences that make social still very difficult for most product teams to effectively use at scale. The first is permission. On social platforms, your application is always speaking through a user. As a result, their intent, their voice, and their identity on the platform is incredibly important. Unlike email, scaling social feed interactions means hitting a mixture of emotion and timing. The second issue is one of conversion. With email, you control an incredible number of variables: content, timing, frequency. You also have a relatively high metrics around open rates, conversion, etc. With social feeds, the dynamics around timing and graph density really matter, and in general it always feels harder to control. Eventually, at scale, your site will likely need to leverage all of the above traffic sources to hit its potential. However, in the beginning, it’s often a thoughtful, deep success with just one of these that will represent your first inflection point. The key to exponential, scalable distribution across these sources of traffic is often linked to virality, which is why that will be the topic of my next post.